Prime Minister John Key discussed the current situation on the TPP, Solid Energy and the upcoming discussion document on family violence in a post-cabinet press conference today. The TPP agreement was unable to be concluded over the weekend, and Key said there were a few challenging issues still remaining. “There is a finite window where if we can’t complete the deal in that time, it becomes for difficult for the United States and others,” he said. The offer on dairy from the discussions were “not close enough for a deal to be concluded”, he said. 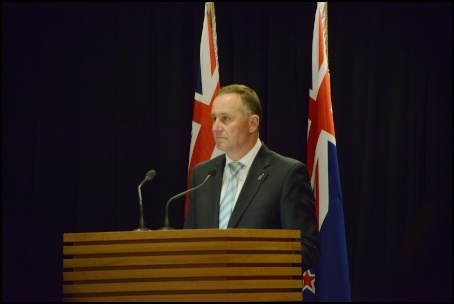 Key said he was confident that the involved countries would reach an agreement that would be in the best interests of New Zealanders. He said coming to an agreement would give New Zealand exporters and investors access to more than 8 million companies, and ultimately the TPP would create better opportunities and standard or living for New Zealanders. Justice Amy Adams will soon be announcing a discussion document about family violence and how New Zealand can address it. As a serious issue, family violence deserved more attention, Key said. The intention of the discussion document is to spark debate and nationwide conversation about how New Zealand should address family violence, Key said. The government would potentially be willing to put more funding towards addressing family violence, he said. Key said if New Zealand could reduce family violence, we would be a “much better society”. Singapore are set to celebrate 50 years of independence. Key is travelling to Singapore this week to attend the festivities, as the date also marks the 50th anniversary of diplomatic relations between Singapore and New Zealand. When Key was questioned about Philip Blackwood and whether or not he missed out on getting released from prison in Myanmar, Key said the government was keeping a close eye on the situation. Key discussed the “precarious position” that Solid Energy are in. The interests of creditors, investors, stockholders and the banks were all involved, but essentially the debt belonged with the banks, Key said. Liquidation of the company was not the preferred option, but it could not be ruled out as a possibility, Key said. Solid Energy is in a “very delicate stage at the moment”, Key said. The government was not planning to invest more capital to keep Solid Energy going. Winston Peters made comments recently that Corrections Minister Sam Lotu-liga was in that position because he was Polynesian. Key addressed this, saying: “People should be chosen on ability, not ethnicity”. On the issue of G20 and tax evasion, Key said the New Zealand government had “always found the Cooks to be good partners”. When asked about potential GST charges on digital services and physical goods, Key said he had not had a discussion at Cabinet about that, but that New Zealand officials were working closely with Australian officials. The New Zealand threshold would potentially be similar to Australia’s threshold, but it would have to come down, otherwise the gap would be too large, Key said. Key said New Zealand officials were still working on how best to implement these changes. Last week, Key said he believed Māori Language Week was important for New Zealand, but that it did not need to be extended to a full month. He stood by his comment in the conference today, saying it gets more intensity in the shorter time period.